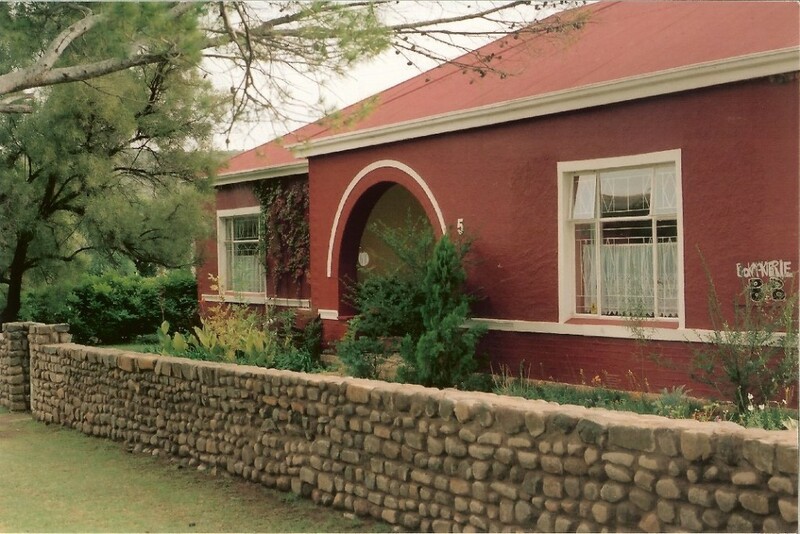 Accommodation in Smithfield: Bokmakierie B & B. Our spacious old home offers guests three double rooms with en suite showers. Crisp white linen and towels are offset by individual colour schemes. There is safe, off-road parking and a separate guest entrance from the parking area. The long, broad passage is painted gousblom yellow and, above the picture rail, the original mud plaster has been exposed. The walls of the passage are lined with Peter’s naïve art and, without too much encouragement, he will introduce you to the characters that he uses in his paintings – his trademark dogs, long-necked camels inspired by the Owl House in Nieu Bethesda and “parrotmen”. The lounge, diningroom and entrance area have high pressed steel ceilings and the floors are polished Oregon boards throughout. Fans in the high ceilinged rooms help to overcome the heat of summer but winter is red wine weather with the Esse stove in the kitchen, a fire in the lounge and hotwater bottles in the beds to stave off the cold. Smithfield is the third oldest town in the Free State and there is plenty of interest for history buffs such as the Caledon River Museum and the historical cemetery. For sports enthusiasts there is golf, tennis and bowls. We have lived in many parts of South Africa – over 25 years in the Free State – as well as in Namibia and can offer a wealth of advice and information to both local and overseas tourists about interesting routes to take and what to see along the way as well as a few urban legends! Experience Free State hospitality and good value – and a hearty breakfast to set you on your way!